It’s been over 10 years since the biggest green initiative in Singapore started. This initiative involves Singapore taking the pledge to reduce their emissions by 36% by the year 2030. This is not an easy task, and while the initiative involved slightly over a dozen organisations in its beginning, it now has over 700 different organisations and businesses involved. In other words, going green as a business in Singapore is not a matter of prestige anymore. It has reached the level of a standard for success. In order to run a successful business you can get uniforms for your staff and floor mats that make your venue looks highly professional and add to your green efforts. This is, of course, just a beginning. You will have to think long and hard in order to turn your business more environmentally-friendly. If you are not following the path of sustainability, you are hardly going to be considered a reputable business in Singapore nowadays. One of the fastest ways to go green at your workplace is to literally make it more green! How? By introducing amazing indoor plants in the workplace. Everybody knows that plant go through the process of photosynthesis and create oxygen. Nice and fresh oxygen for your workplace is just one of the things you plants do for your indoor air quality. Moreover, scientists from the American Society of Horticulture have proven that indoor plants reduce the amount of indoor ozone which is very dangerous for respiratory organs. While you might have expected that ozone is reserved for the outdoors, that is not the case. It is present in many indoor spaces. Some of the chemicals that are more likely to be found indoors involve benzene, formaldehyde, and trichloroethylene, xylene, and ammonia. Again, our green friends come to the rescue – there are many indoor plants that can eliminate these substances from the air. You can help these efforts and try to eliminate some of these chemicals before they even reach the air. Benzene is found in plastic, some fabrics and even cigarette smoke. On the other hand, formaldehyde can be found in many cosmetic and cleaning products. Ammonia is also present in cleaning detergents. Therefore, replace the carpets with the floor mats that will be cleaned outside your workplace. Make sure your workplace washroom is regularly cleaned and maintained by the most eco-friendly chemicals. Those efforts, plus well positioned and carefully selected plants will ensure fresh air for your employees and everybody else who visits your business venue. Obviously, if your plants are big enough, they will provide a little bit of shade and reduce the direct impact of the sun through the windows. But, that’s not the end of the story. By the process of transpiration, plants increase the levels of humidity in the air. In this way, they can decrease the air temperature dramatically, even in your workplace. However, keep them away from the direct impact of the AC, because it can hurt the plants and even kill them. The air coming from the AC is too cold for the plants to survive. Plants have different shapes and sizes. They have leaves, bark or even flowers. All those parts can help absorb the sound from their environment and therefore, make it more quiet. If you surround your cubicle or working space with some bushy plants, you can easily expect a lot less noise coming your way. Your plants will absorb it before it reaches you. As soon as you see the same office with and without the plants in it, you will easily conclude how much better the office looks if there are plants in it. Especially if they have been chosen and positioned by a professional designer. Picking a plant or two and putting in on the desks at your workplace is the least you can do, combined with some corner plants. If your employees don’t have a green thumb, make sure that you get very resilient indoor plants and give your employees guidelines for caring for their desk plant. There are a lot of plants to choose from, take your time and pick the office plants you can take care of. It would be a great idea to include your employees into this decision making process. 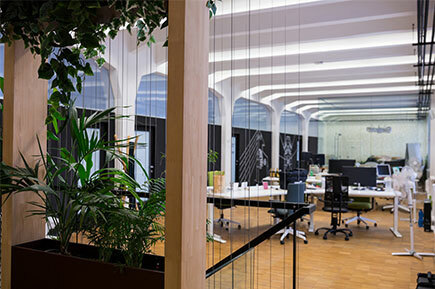 As you can see, this type of design gives your employee a lot of greenery around them and it gives them enough privacy to do their work in peace. The inside part of these big pots can be used to put up sticky notes and everything else that your employee would use a regular wall for. If you really want to give your employee the comfort they deserve, opt for renting perfect floor mats for their cubicles. This will be that final touch you need to make your workplace comfortable and more productive. We have already talked about the plants used as space dividers. There are many interesting and creative ideas for this clever and purposeful use of the workplace plants. However, if this is too complicated, or your space has some limitations, you can even create an entire green wall. One of the most famous examples of such “indoor architecture” is the 158 Cecil Street Green Office in Singapore. Of course, this is a very ambitious project, but it is possible to do something like this on a much smaller scale. Even a nice frame with indoor crawler plants can do the trick. These are all different ideas about how to make your workplace more eco-friendly and more comfortable. There are other options and efforts besides being diligent when it comes to greenery in your office. You need to think about the use of chemicals and cleaning agents, as well as the amount of water you are using. A lot of it goes for cleaning, so try and reduce that amount and pick some less aggressive and more environmentally-friendly options. Your safest bet to go green is to join your forces with Alsco and look into their rental programs. You can opt for those amazing floor mats, washroom services and many other rental options which means that you don’t have to worry about maintenance or capital investments. 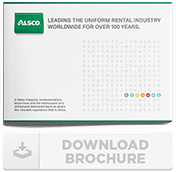 Alsco rents their own mats, washroom equipment and even uniforms to businesses for a monthly fee. We also maintain it and that includes industrial-level washing with the most environmentally-friendly detergents used. Call us today and make one giant step toward becoming more sustainable and environmentally responsible business.